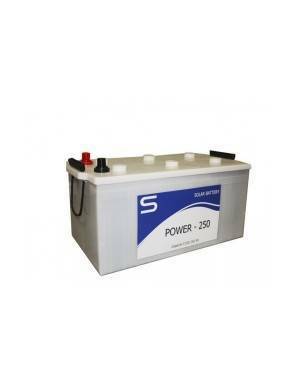 Monoblock Batteries There are 22 products. The monoblock batteries,that we include in this category; open lead acid batteries, due to their lower cost are the most widely used renewable energy facilities of small and medium size. 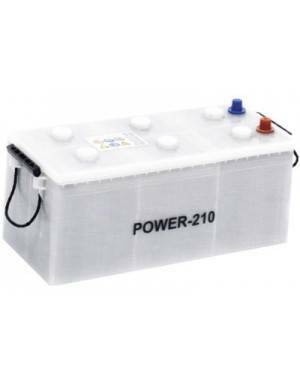 MONOBLOCK BATTERY POWER 70 12V 70AH POWER monoblock batteries are intended for photovoltaic off-grid installations. They are very versatile batteries with the best quality / price ratio. MONOBLOCK BATTERY POWER 85 12V 85AH POWER monoblock batteries are intended for photovoltaic off-grid installations. They are very versatile batteries with the best quality / price ratio. 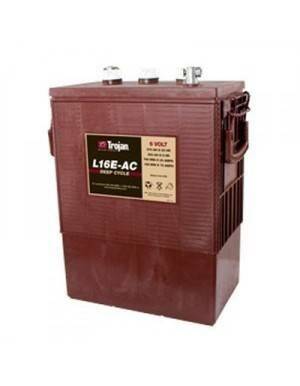 MONOBLOCK BATTERY POWER 115 12V 115AH POWER monoblock batteries are intended for photovoltaic off-grid installations. They are very versatile batteries with the best quality / price ratio. 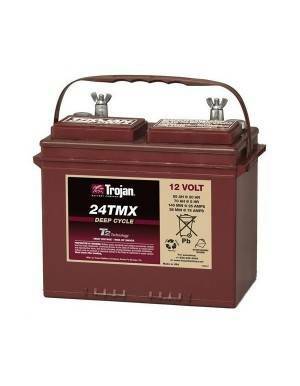 Battery TROJAN 24TMX 12V 94AH Deep-cycle 12V battery from the well-known TROJAN brand. The Trojan 24TMX model is especially suitable for small accumulation solar systems, whether off-grid or for self-consumption in grid connected systems. 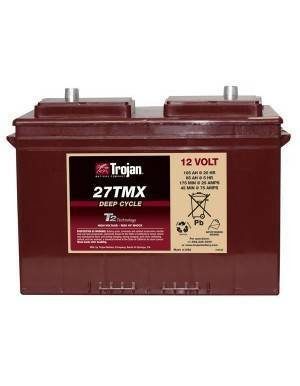 Battery TROJAN 27TMX 12V 117AH Deep-cycle 12V battery from the well-known TROJAN brand. The Trojan 27TMX model is especially suitable for small accumulation solar systems, whether off-grid or for self-consumption in grid connected systems. 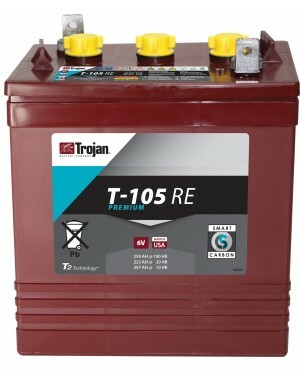 Premium battery T105RE Trojan deep cycle 6V 250Ah Battery Trojan T105 Premium RE series are specially designed for renewable energy. Lead Acid Battery flooded / wet for renewable energy installations, hybrid storage facilities and emergency systems. 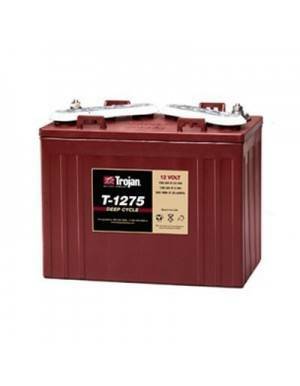 Battery TROJAN 27TMH 12V 128AH Deep-cycle 12V battery from the well-known TROJAN brand. 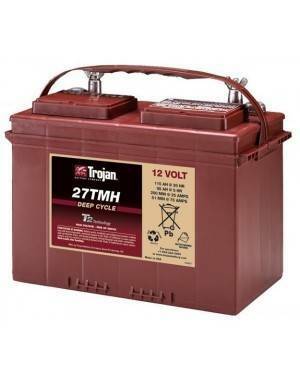 The Trojan 27TMH model is especially suitable for small accumulation solar systems, whether off-grid or for self-consumption in grid connected systems. 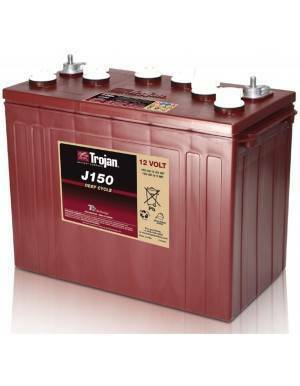 Battery TROJAN T125 6V 266AH Deep-cycle 6V battery from the well-known TROJAN brand. The Trojan T125 model is especially suitable for small accumulation solar systems, whether off-grid or for self-consumption in grid connected systems. Battery TROJAN T145 6V 287AH Deep-cycle 6V battery from the well-known TROJAN brand. The Trojan T145 model is especially suitable for small accumulation solar systems, whether off-grid or for self-consumption in grid connected systems. 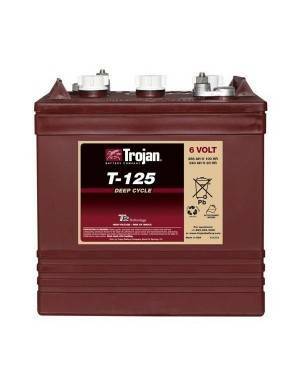 Battery TROJAN T1275 12V 166AH Deep-cycle 12V battery from the well-known TROJAN brand. The Trojan T1275 model is especially suitable for small accumulation solar systems, whether off-grid or for self-consumption in grid connected systems. 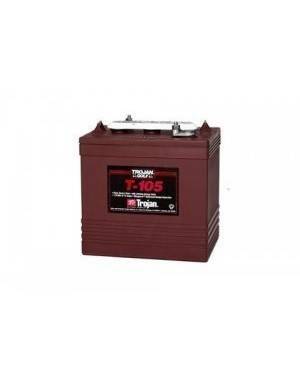 Battery J150P Trojan deep cycle 12V 166Ah Trojan Battery J150P, suitable for renewable energy. Lead Acid Battery flooded / wet for renewable energy installations, hybrid storage facilities and emergency systems. 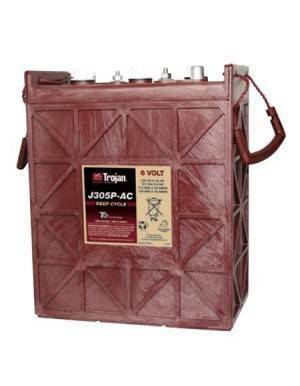 Battery TROJAN J305P-AC 6V 367AH Deep-cycle 6V battery from the well-known TROJAN brand. The Trojan J305P-AC model is especially suitable for small accumulation solar systems, whether off-grid or for self-consumption in grid connected systems. 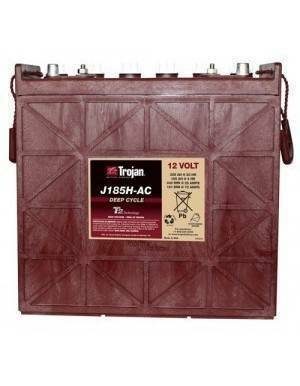 Battery TROJAN J185E-AC 12V 194AH Deep-cycle 12V battery from the well-known TROJAN brand. The Trojan J185E-AC model is especially suitable for small accumulation solar systems, whether off-grid or for self-consumption in grid connected systems. 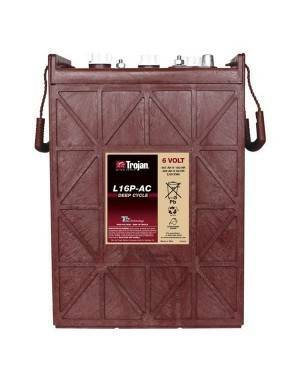 Battery TROJAN L16E-AC 6V 411Ah Deep-cycle 6V battery from the well-known TROJAN brand. The Trojan L16E-AC model is especially suitable for small accumulation solar systems, whether off-grid or for self-consumption in grid connected systems. 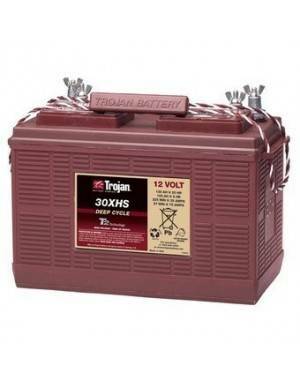 Battery TROJAN L16RE-2V 2V 1235Ah Deep-cycle 2V battery from the well-known TROJAN brand. 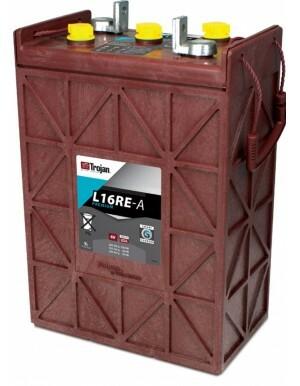 The Trojan L16RE-2V model is especially suitable for small accumulation solar systems, whether off-grid or for self-consumption in grid connected systems. 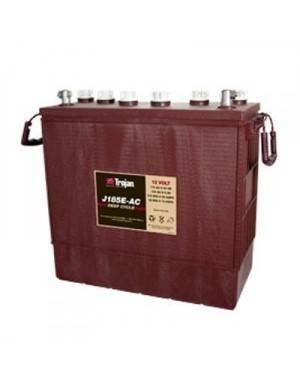 Battery J185H-AC Trojan deep cycle 12V 249Ah Trojan Battery J185H-AC, suitable for renewable energy. Lead Acid Battery flooded / wet for renewable energy installations, hybrid storage facilities and emergency systems. They store energy from solar panels or photovoltaic modules, as well as other sources such as wind or auxiliary generators to be usable as appropriate. Must be installed in ventilated areas, because in its loading and unloading processes can evaporate some gases that indoors can be harmful. And they require little maintenance, in general, can be summarized as: filling distilled water to maintain the proper level periodically (according to manual), and equalization every few months. In addition, to improve their life, should never exceed 50% depth of discharge, this being greater the lower the level of discharge perform in each cycle. In general, monoblock lead-acid batteries are storage system lower cost, as part of a solar kit small or medium. They are able to store high yield power generated by wind turbines or solar panels kit, for later use them at times that are not available renewable resource for generation. Require little maintenance and be installed in ventilated areas, but instead offer to store significant amounts of energy at low cost, thus enabling cost have a very tight final generation of kWh.